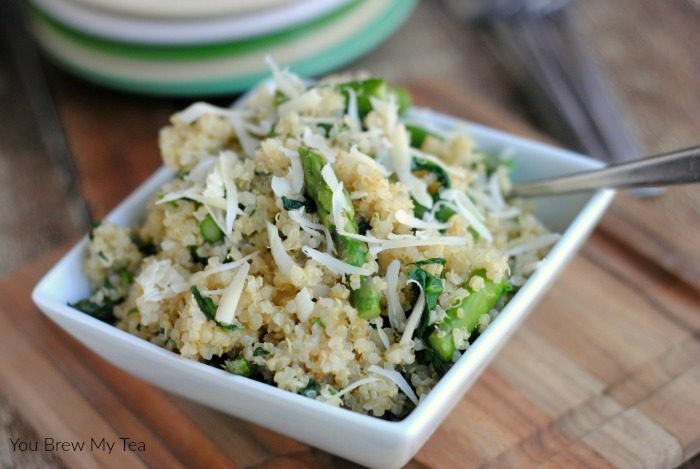 I confess, quinoa wasn’t my top choice for sides,but this Asparagus and Quinoa Side Dish sounds amazing. Over the last few years, I have tasted a few dozen quinoa recipes and have learned to love the flavor and textures when they have the right seasonings. This mixture is seriously delicious and would make a great healthier option to keep in your meal plan rotation. This post contains affiliate links. I may earn a commission through purchases made via these links. 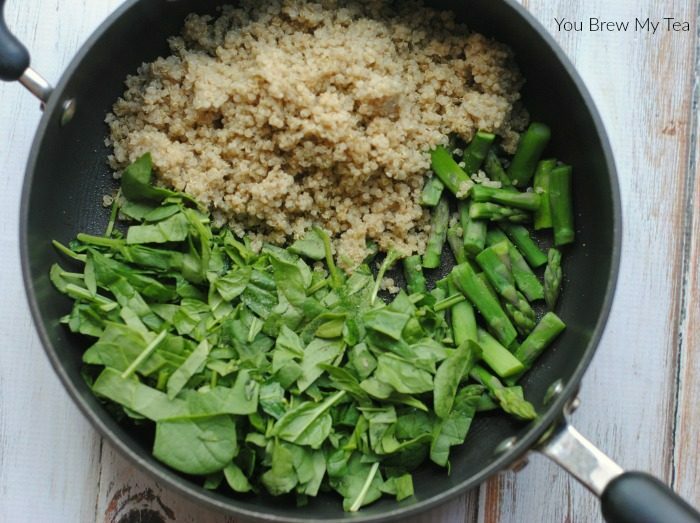 Using a quinoa side dish instead of your classic starch like rice or potatoes is a great way to have lower carbs in our diet and add in some extra protein. Since I am a Weight Watchers fan, it makes sense to up my nutrition while lowering those pesky carbohydrates. This is a great solution. I have cooked quinoa a number of times in the past, and the best way to cook it is to follow directions on the package, but make sure you rinse it well prior to cooking. If you don’t rinse it well, there is a bit of a husk and texture issue, at least that has been my experience. Prepare quinoa according to package directions. You may use a rice cooker for this to make it easier. Heat the olive oil in a large skillet. Add in the minced garlic, asparagus, and onion and cook over medium heat for 10-15 minutes or until tender. I prefer my asparagus a bit less tender, so you can add it in last if you prefer. Add the spinach to the mixture and cook 3-4 minutes or until it wilts. Next, add the already prepared quinoa and stir the mixture to combine all the ingredients. Cook for 3-4 minutes, then stir in Parmesan cheese. Stir the mixture allowing the cheese to melt. This quinoa side dish makes approximately 4 servings and is ideal for a different option for your holiday menu plan. With such great healthy and nutrient dense ingredients, it is a good choice for your diet. However, with so much protein and the added cheese, it will create a larger Weight Watchers points value as a side dish. So, plan to serve with a lean protein like grilled chicken or fish. While it is something I would limit to only on occasion for this reason if on a restricted diet, it is still a healthier choice and ideal for low carbohydrate diets. This was calculated using the Recipe Builder tool within the Weight Watchers program online. The points value for SmartPoints using this is much more accurate than the free calculators I have found online. If you want to calculate on your own, you can also invest in the Weight Watchers SmartPoints Calculator. 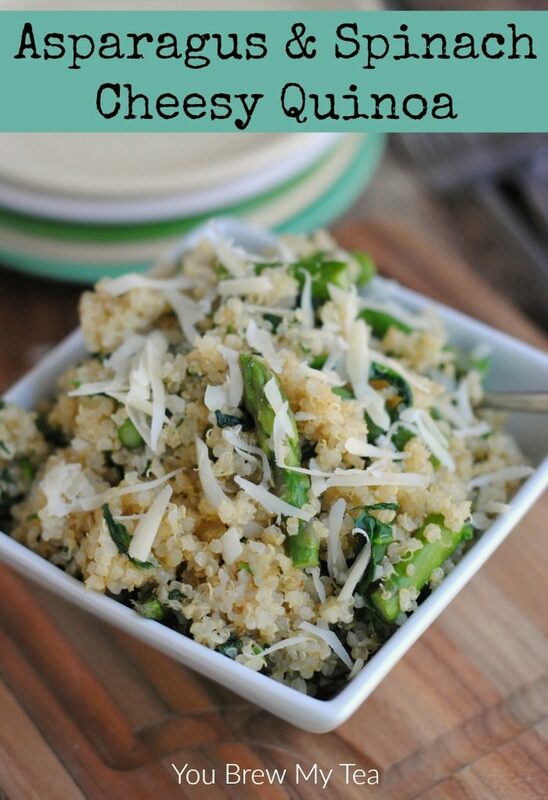 I love the idea of adding a quinoa side dish into our meal plan to boost protein while limiting carbohydrates. In fact, this recipe is a tasty side that even the Wee Child approves of. He prefers peas over asparagus, but it’s a great way to get him to branch out and eat different vegetables.